The ability to stand upright and to move body limbs without pain is an important part of your overall wellbeing. Physical pain and limited movement, when left untreated, can affect confidence and emotional health. Physical therapists are experts in movement and function, with a significant focus aimed at preventing injury or loss of movement. If injury or disability in mobility has already occurred, physical therapists work to restore the loss of movement and to alleviate pain. Some causes for loss of movement include injury, arthritis, sports or dance activities; and improper stretching. Many people with arthritis think they must live with the pain. However, with conditioning, the muscles can be strengthened to support the bone and the patient can learn joint protection strategies. Common issues stemming from sports and dance activities are muscle strains and joint pains. Ninety-percent of young athletes have been injured while playing a sport, and 37% of those injuries were sprains and strains, according to a 2014 Safe Kids Worldwide report. Dancing is also a high-impact activity, with up to 90% of dancers experiencing some form of injury. Dance movements naturally put great stress on bones, muscles, tendons and ligaments. The risk of dance injury is greatest for young dancers during growth spurts when a youth’s bones are weakest – typically age 8-12 for girls and age 10-14 for boys. During the growth spurt period bones grow faster than soft tissues, and as a result, young dancers and athletes often experience tight ligaments and more limited muscle strength. Both experiences feel like a diminished level of flexibility and coordination. If a player experiences significant pain, he or she should never try to “work through” the pain of the injury as it may cause more damage. If a dancer or athlete is injured, early medical intervention can drastically reduce rehabilitation time and return them to performance or sport quicker. • If muscle pain does not show improvement within 48-72 hours. • If your body needs to be conditioned for any seasonal or strenuous activity, a physical therapist can help you train properly and address most pre-existing issues (surrounding weakness, decreased mobility, speed and balance). • If you experience any decline in your ability to do activities once done with ease. • If a joint or limb does not feel normal or stable. If your movements are limited, there are a range of treatment techniques that can be implemented to help achieve a greater range of movement and activity tolerance, including: passive range of motion (PROM); joint mobilization; cardiovascular conditioning and dry needling, to name a few. Trigger point dry needling is one method used to address chronic muscle pain. It involves placing a thin needle into the muscle at the trigger point – typically an area where the muscle is tight and tender – causing the muscle to contract and then release. This improves the flexibility of the muscle and therefore decreases the pain symptoms. Dry needling allows therapists to address pain hidden layers beneath the skin where it originates while diminishing the referred pain patterns often accompanying these trigger points. Dry needling is used often as an intervention with chronic pain conditions, and patients have reported significant results after trying the technique to address various forms of physical pain. The technique may cause some muscle soreness initially as it loosens tight muscles, but in many cases, improvement is noticeable after the first session. 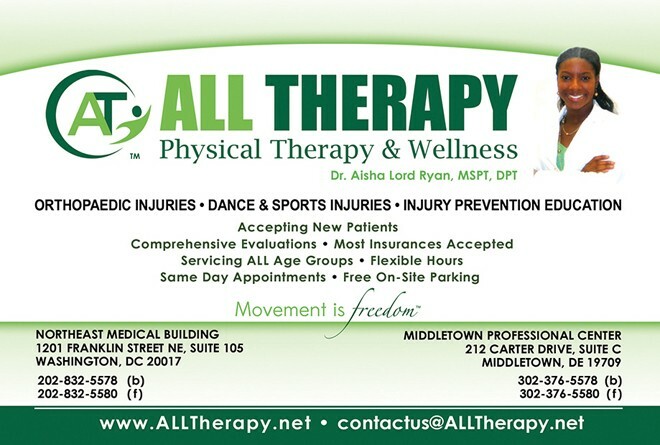 Dr. Aisha Lord Ryan, MSPT, DPT, CMTPT is the founding director of ALL Therapy with practices in Middletown, Delaware and Washington, DC. Specializing in orthopaedics, dance and sports-related injuries, Dr. Ryan is one of a handful of Delaware therapists certified to treat chronic pain with Dry Needling. Dr. Ryan holds Master’s and Doctorate degrees in Physical Therapy from Columbia University and a Bachelor’s of Science in Exercise and Sports Science from the University of Delaware. Dr. Ryan is a member of The American Physical Therapy Association (APTA), the International Association of Dance Medicine & Science (IADMS) and Delta Sigma Theta Sorority, Incorporated. A trained dancer, Dr. Ryan takes great pleasure in merging her educational training and experience to provide personalized rehabilitation to patients. She provides on-site care to performers at The John F. Kennedy Center for the Performing Arts, and is a frequent speaker at seminars and workshops on injury prevention & rehabilitation for dance, sports and senior adult populations. You don’t have to live in pain. To make an appointment or book Dr. Ryan for a workshop or seminar, contact our office today at (302) 376-5578. “Always a great experience! ALL Therapy is welcoming. “I had a great experience; challenging but appropriate. The staff is professional and congenial. They are very pleasant to work with. Next Story → Why Are My Teeth Wearing Away?